Match.com was launched on the Internet on April 21, 1995. 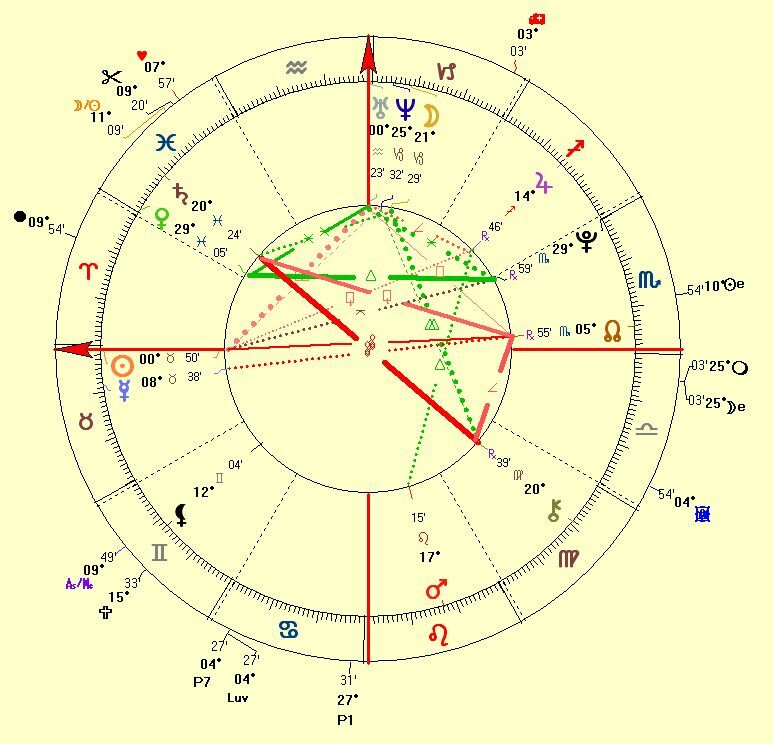 Below is the foundation chart with the Sun on the Ascendant. Match.com is by far the biggest online matchmaking site with some 8 million members worldwide, resulting in more than thousand marriages (confirmed) and hundreds of thousands of relationships. So due to their huge database, the odds are that you may find someone. Perhaps not really your soulmate, but possibly a friend. Venus, Uranus, Pluto and Jupiter are all at a 'critical degree'. In astrology the 29- 0th degree area is a transitional degree zone bringing a new beginning while the 15th degree of any sign (right in the Centre of it) reinforces the significations of the sign. Jupiter at the 15th degree of Sagittarius is in a most influential position. Jupiter is namely in its own sign (in rulership) at the most powerful and expansive degree of the sign, indicating worldwide recognition and continuous growth. Jupiter in Sagittarius becomes more 'pushy' with the trine to Mars in royal Leo. There is an enormous tendency to shine, express itself and dominate. This configuration constantly seeks attention. Uranus too, is very strong in its own sign Aquarius (in rulership) in an exact sextile to Pluto in the expansive Sagittarius. This combination indicates worldwide and widespread transformations through hi-tech (r)evolutions. Actually, The corporation chart of Match.com shows a very sociable small trine in which Uranus is the focal point/planet. Uranus is a very strong planet in it's own sign, always going its own way (confirmed by the square to the Sun). Nothing stays the same with Match.com, it always develops and transforms itself, bringing in new experiences and always looking foreward. 2004 will bring a decline for Match.com because transiting Pluto squares Saturn and Chiron in the corporation chart. There may be changes in the management (transiting Uranus square Pluto in the corporation chart), with people leaving (transiting Neptune trine North Node in the corporation chart and transiting Neptune in opposition to Mars). There is much uncertainty (transiting Neptune in aspect to the Uranus/Pluto midpoint) because of new technologies coming up, but Match.com keeps the power and control of the entertainment and online dating industry. Update February 2006: In April 2004 Match.com launched a video-enabled instant messaging service, allowing users of Match.com Messenger to view potential dates live, via webcam while sending and receiving text-based messages. In September 2004, Match.com hired a new CEO, Jim Safka.